Rain tree wood is extremely popular and can be found in a variety of applications again. The tree (Latin Samanea saman) is a Mimosagewächs and is a very well-known tree species. They are found especially in the tropics of Central and South America. Colloquially, one also speaks of the rain tree, although it is no longer clear where this name comes from. It is said that it rains lightly under this tree at night. This can be seen very much in the dry season, because the grass under this tree is much longer green. Another possibility would be to call the tree a rain tree because it folds its leaflets when it rains. The trees all have quite typical features, which are also unique to these trees. If the tree stands alone, then this will be on average 17 to 24 meters high. The trunk has a diameter of 40-120 centimeters and the crown has a diameter of about 30 meters. But there were also some cases where the tree has ripened for several years and was ultimately 45 meters high. The crown was about 60 meters wide. In May and June, the main flowering period of the tree begins. Then single delicate, tassel-like, flower-shaped, pink small plants and flowers emerge. The height of this is a maximum of 3.7 inches. Furthermore, fruits are also formed. Here arise brown or black pods. The rain tree is used very differently. 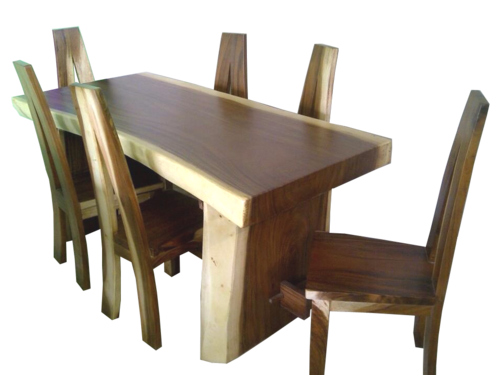 The wood (also called Albizia Saman) is used, for example, if you want to create solid wood furniture. However, the use can also look very different. If you look at pictures, then you often see groups of people standing under the trees, which has the reason that these trees often act as shade donors. But not only for humans the rain tree serves as a shadow donor, but also for coffee and cocoa plantations. As the rain tree also forms fruits, these then serve as food for a wide variety of animal species, such as cattle, goats or pigs. But not only animals like to eat the fruits, children love the sweet pulp too. From the pulp was then even win a delicious drink in Mexico. Partial attempts are made to distribute the seeds manually to create more of these rain trees. After all, the wood is in great demand and also extremely massive. In Hawaii, for example, the wood is used to make craft items. You may already have heard of the so-called "Monkey pod bowls". These are then small bowls or the like. The feeling of this wood is extremely pleasant and also looks very robust. The fact that the solid wood is very scratch-resistant, these bowls can then not only be used for food, but could theoretically also serve as a container for keys or the like. As already indicated, we use the wood for the production of furniture, cabinets and other veneers. Due to the unique properties, such as scratch resistance and robustness, these pieces of furniture are very popular, especially among young families. Since the children often damage and scratch other pieces of furniture or veneers. The same applies to pets, such as dogs and cats. If you have further questions after this article, then feel free to send us an email or subscribe on Facebook. We would be very happy to receive a mail!